.... all that to say, i wrote the staff column for the paper this week. since it's our hunting/wildlife feature edition, i figured i'd write about my recent hunting experiences, being new to the sport and all. i hope it stands up to the scrutiny. rather than put something out there and be told to change it, i'd really not rather put my thoughts out there at all. the blog is different, for some reason. maybe it's that the newspaper is in print and official and it's my job. more pressure! this is what i just finished writing for this week. i hope the readers and publisher d approve and find it interesting. This year my life has included a lot of firsts, and right there amongst “buying a house” and “getting married” is harvesting my first head of big game – a buck antelope in Area 63. I didn’t grow up in a hunting family, so last fall when my now-husband Scott asked if I wanted to go along antelope hunting, I left town in the early morning darkness with my precious hot coffee to trudge around with a group of hunters in the cold and snow looking for antelope – my first hunting experience. Although not thoroughly impressed, I was intrigued. Not long after, I found myself with a general elk license, through the Wyoming Game and Fish Department’s Hunter Mentor Program, looking for elk northeast of Meeteetse. Upon sighting a group of elk, the others in my hunting party grabbed their stuff, set up and had three in short order. Amidst the excitement and stress, and being urged to shoot, Christy, shoot! I only managed to fire once. I never said I was the quickest on the draw. It was then that I started to understand hunting. After the season opened, one sunny morning Scott and I went out looking for my antelope. We had several in mind, and spent several hours glassing antelope. After stalking, crawling and sneaking, we finally came upon a real pretty one, standing right at the water tank staring at us. He wasn’t really tall, but his horns curved over nice, and he stayed right there while I got out of the truck, leaned across the hood and took a shot. And I have no idea where that bullet went. I think he’s forgiven me, but I don’t think he’ll ever forget how I snipped at him for that comment! We did stop, and I did take a couple shots at a distant rock to make sure I wasn’t totally incapable of aiming. After regrouping we headed to another section of the area, and found a good-sized herd of antelope in a draw. After looking them over, I picked one out, and hit him with my first shot – one much farther than I’d taken at the water tank. However, he didn’t go down, and I really didn’t want to chase an injured antelope. In my haste I shot over him, shot under him and then jammed the rifle. I loaded one more shell, took my time, and finally dropped him. Although he’s not the biggest antelope in the world at 14 inches, I’ve decided to mount him as a memento to my first successful hunt. And, thanks to the encouragement and help of my hunting friends and family, I will be back again next year. .... then hilton garden inn wins best shower. there are glass doors, and the towels are in the shower! their kitchenette wins good points, too. this is my dinner, from the next door eatery, mcalister's. chilli and half a sandwich. mcalister's is also where i'm meeting friend judy rogers for lunch tomorrow. laramie is a college town. the state's only university is located here, and the football stadium is not far from my hotel window. it's interesting, being in a college town again. being in my day-to-day routine of managing the details of the newspaper, working on my house, spending time with scott, being up at the ranch and elsewhere in the state, college is a distant memory. so it's interesting, watching the college kids. so that's all i'm up to. scott says my new social security card came in the mail today, and along with lunch tomorrow i'll probably meet judy again in the evening at the cowboy bar - apparently a friend of hers is playing music there. last night scott and i had bob, becky and jamie to the house for dinner. i tried to leave work early - ended up not being early enough - to run to the grocery store, get started on the food and do some quick cleaning around the house. the cleaning dropped off the priority list. i wish it hadn't, because after everybody left scott came from the bathroom and mentioned that we forgot to restock the toilet paper! how mortifying. but as it was, i was running late getting dinner ready. i'd already shopped for pw's enchilada recipe from her cookbook, so i carefully defrosted a package of beef while i also made the brownies with coffee frosting from her cookbook. when the beef was fully defrosted, i opened the package only to discover that it was not ground beef, but tenderloin. the beef was from the longhorn steer tyrone, and all packaged the same, and i didn't even think to examine it more closely. so then i was way behind, starting over with a frozen block of what i was sure was ground beef. i barely had it started thawing, and i see bob and becky getting out of their truck in front of my house. thirty minutes early, and scott wasn't yet home from work. and i still had to make the black bean and corn salad, chop lettuce for a tossed salad, and make the frosting and the mexican rice. turns out, i ditched the rice. thankfully, it took scott and bob a while to get the stovepipe installed, and that saved me. brownies came out of the oven, enchiladas went in, black bean salad was mixed together with dressing - i was praying the corn thawed out enough before meal time, some dishes were done and i whipped up the frosting before setting the table, getting ice and setting out a pitcher of water. all in the space of an hour and a half. so, i intended to take some photos of the recipes and post them, but the hurry also dropped that off the priority list, so i apologize. the enchiladas tasted fine, but would have been labor intensive, had i followed the recipe exactly. she makes her own tortillas for them, which i'm sure are worth it, but my store-bought tortillas in the fridge were sure easier. she also dipped each tortilla in the enchilada sauce before filling and wrapping them, and i also skipped that. the coffee frosting brownies - i forget their real name - were really good. a nice balance between chocolate cake and brownies, and the frosting had just a hint of salt with the coffee flavor, which makes it addictive. at least to me. i hope there are some left when i get home! i left casper early this morning for laramie, and now i'm sitting at the wyoming water association annual meeting for the next three days. hoping to meet up with long-time iowa friends judy and avery rogers while i'm here, as well as scott's and my neice, tavy, who attends uw. from my office window i can see part of the mountain, and as of yesterday there are now a few inches of snow up there. now, i've never been one to rush winter, but indian summer certainly did us justice this year, with a gorgeous slow fall, and now that we have the wood stove i'm anxious for cold snowy days so we can use it! i told scott that since it was snowing that meant it was time for christmas decorations! yesterday scott took off work, and it was cold and dark and raining and i had to go to the office! he did come by and take me and his mother to lunch, though, so he kind of made up for it. this morning was the first really chilly morning, and the link cat stepped outside and came right back in. he's not a cold-weather cat. last night scott and i spent the evening watching dancing with the stars - my choice - and addressing, stuffing and labeling wedding party invites. i did part of my iowa list, and still have more names to think of, and then we have to chase down the rest of the addresses. but we've got a good start. tonight i get to make dinner for bob and becky, who are coming into town. scott's going to pick up a load of firewood from trav's stockpile this evening, and he and bob will install the stove pipe. i guess they're not going to wait for the chimney sweep and will go ahead and fire it up. i'm ready to have a fire crackling in the front room! 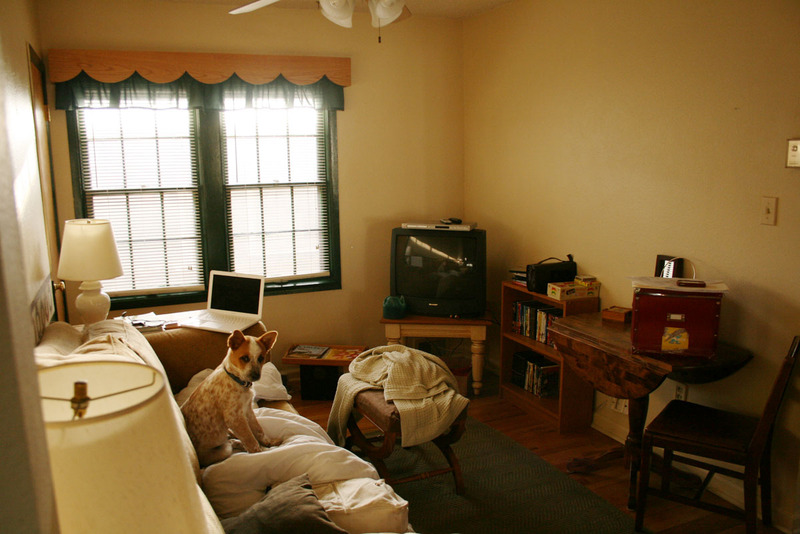 this is what my tv area looked like last spring, shortly after moving into the house. notice the wood scallops and green frills on the window valance. and that cute red puppy!! this is what the tv space looks like as of this morning. i wish i'd had better photo conditions, like the late afternoon sunshine in the photo above, but you can get the idea. i get up too early. look how pitch-black it was in the photo. my weekend project was tearing down that valance, patching the holes in the walls, making the new roman shades and mounting the shelves and putting new my library book sale books on them. scott's wildlife statues were supposed to go on them, but alas, they're too tall and won't even fit up there. but, i kind of like the books up there. i will have to find another idea for the statues. this is what it looked like still mid-project, before the shelves were mounted. this is where i will probably leave the shades in the daytime, to let in daylight but block the view of the neighboring house. it's a big improvement from the white plastic mini blinds that will go out with the garbage this week. 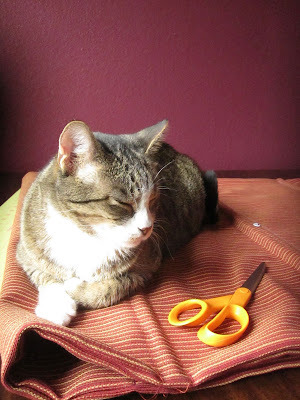 link felt like i needed his expertise when i was sewing the rings to the back of the shade, through which the cords run for lifting the shades up and down. in this photo you can see the real pattern of the fabric. it's a very autumn-y color combination, and it does make the room dark. for winter, that's cozy, but i'm thinking maybe for the summer i'll make another set lighter in color and weight. they really weren't hard to make, once i figured out the measurements. here's another 'before' photo, just because. now we have a different tv, and my photo collage has taken shape on that blank wall across from the couch. it's starting to feel more and more like home! today is rainy and dark. and scott took the day off and he gets to sit at home and be lazy! it's not fair, but his mother is coming up and we're going to lunch this afternoon, so that will be nice. at least we don't have the wood stove operational yet, otherwise i might not have been able to leave the house for all the coziness and warmth. Just because it's 4:02 on a Friday afternoon and I'm just looking back through the issues that ran this time last year, making sure I'm not missing anything we usually cover annually, and because I like the photo in our lead spot this week, here's the cover of this week's paper. That's Dale Micheli, the interview I did last week before heading to the AgriFuture conference. 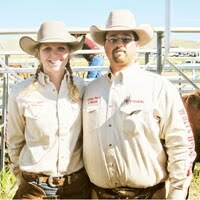 Those bulls will be up for sale in the Micheli Ranch Bull Sale coming up next week. I like it when Tracy puts a lot of color on the front page. And I like that she's started making the box around the lead spot bigger. The weekend is (almost) at hand! - Hook up the blueray player to my router and see if I really can get Netflix to play on my TV, and if it's simple to do. - Make top-down roman shades for the west living room windows. - Purchase and install shelving for the basement so I can organize the random odds and ends that are languishing. - Purchase a tall step ladder or extension ladder to clean the gutters on the house before snow-time. - While I'm up there at roof-level, hang Christmas lights from the eves while it's still gorgeous outside. - Take the dogs and wander around the neighborhood with my camera to photograph the amazing leaves that are still lingering. - Go to the Macy's one-day sale with my gift card. - Visit Odds and Ends - it's been too long since I've scoped out the used furniture. - Go to the Beacon with friend Jamie one of these nights. - See if there's anything inspiring at Ross. - Clean the downstairs bathroom - it's been a while!! Scott would be impressed. - Sleep in. Past 5 a.m. Even on the weekends, Scott wakes up at 5 or earlier and starts chit-chatting. Needless to say, he doesn't get much response. - Replace the glow plugs in my car. - Replace the headlight in my car. - Go crazy and clean out the inside of my car. And wash my truck. And clean the inside of my truck. - Take in the plants I want to save from frost. Including a few of the herbs. My parsley still looks amazing. - Go to Hancock Fabrics and check out their sales this weekend. They have burlap discounted! - Visit the library's annual fall used book sale for some colorful, worn hardbacks to add to my bookshelves. - Drink large amounts of black coffee with a splash of milk. - Go to Highland Park. - Sweep the leaves out of the patio so it's ready to stack firewood. - Take the Prince Edward Island prints to Hobby Lobby to find frames and mattes. - Tear the carpet off the lower half of the basement steps. - Find narrow shelving to hang in the hall upstairs to display Scott's collection of shot glasses. - Address and mail some more wedding party invites. - I'm getting the idea that this list could be endless.... Here's to being productive and not wasting my precious free weekend. for the last almost-four-and-a-half years, my friday mornings have consisted of publishing the paper. 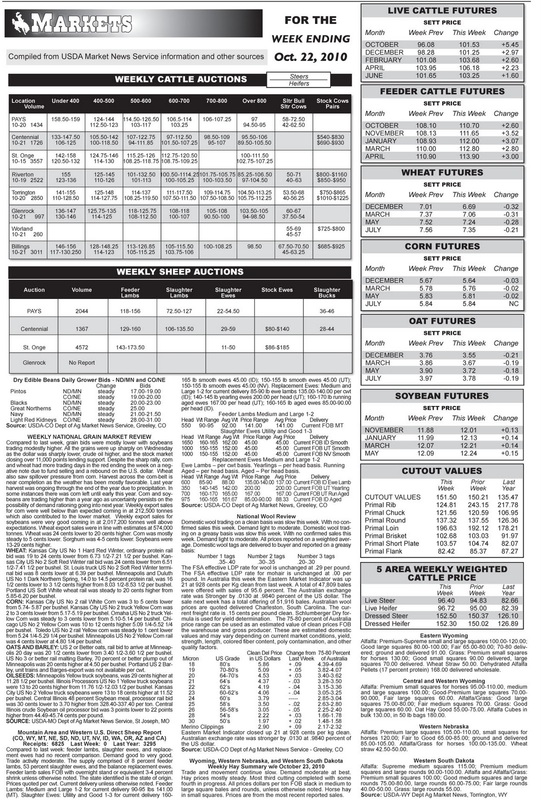 amidst proofing, changes, captions, headlines, typos, additions, subtractions and lattes, i've also helped with the weekly market update for a while. 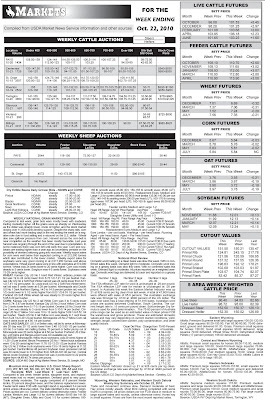 coworker jody takes care of the regional sale barn figures and the charts, while i find the usda numbers for the week's national beans, grains, sheep, wool and hay markets. it might look like a boring page, but all these prices, columns and figures represent the general state of agriculture at the time. this time of year many calves are moving through the sale barns, as weaning, shipping and fall work progress. there are five different usda websites i visit to find the text in the lower half of the page, and i combine them all into one document, import them into indesign and proceed to format, resize and set the tabs in the columns. as with all layout and design of a publication, it's a puzzle that you have to figure out how to solve in a different way each week. and if you don't know the tricks to getting the tabs to work, it'll never happen. thankfully, i've had practice and have developed a pretty good system, so usually it comes out looking nice and neat and doesn't take much time. so, usually by 10 a.m. all my work for the paper is done. i print the paper thursday afternoon to take home for proofing thursday night or friday morning, so i can take my time and not rush through it. usually i do it thursday evening, but with dinner guests last night i didn't get it done. no worries, though, scott always gets up at five - a habit i've adopted. i'm not yet sure if it's by choice. :-) but, having three hours before heading to the office gives me a lot of time to get things done. this morning i proofed, watched the news, did the dishes and frosted some pumpkin-chip cookies for scott and bob to take hunting this weekend. after arriving at the office i typed out my changes - according to page number, column number and paragraph number - for tracy, then added heather's and dennis's and sent them along. i also write the 'inside box,' an index of sorts, to lead people into four of our 'inside articles.' then i finish up the markets and send them off to tracy, and i'm good to go for the week. usually jody has to wait for last-minute ad changes on a couple ads, and we have it completely to the printer by 10:30, usually. so now i can go home! well, not really. next week is our hunting/wildlife special feature edition, so i'm going to get a start on some of those articles. my two for the cover focus on a new gps application that helps landowners track trespassers, and the other is about landowner licenses, and why the game and fish commission won't let landowners sell or donate them to other people. the commission can transfer their own to other people. funny, isn't it? 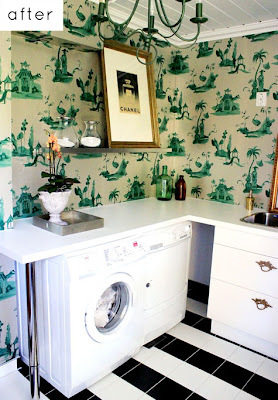 this picture here is pretty comparable to what my laundry room currently looks like. disorganized, bland, not functional. pretty much, not a space you'd want to spend much time in. right now mine stores a few christmas decorations, has a tile floor in poor shape, the upstairs bathroom drain runs right down through the middle, and not only that, it pretty much splits the washer and dryer, so i have to work around it to flip my laundry. this project was featured today on design*sponge. 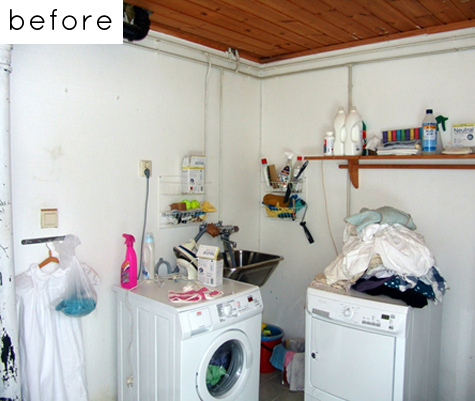 i would love to transform my laundry space into what this space turned into. i actually don't care for the wallpaper or the tiling on the floor, but at least it's clean and organized and pretty! i like the artwork, and the counter. i'd like to move my dryer around to the right side of my washer, like it's supposed to be. why have my last two places had dryer hookups on the left side of the washer? it's very inconvenient, and no, the door on my washer does not flip around so it opens to the left instead of right. that way, if i moved the dryer, the pole issue would be solved, and i could put in a counter top similar to this one that would stretch over to the left into the space where the dryer currently sits. i could put drawers or bins beneath it. i really need to redo the floor, and repaint the seafoam green walls, and tear the weird tiling off that covers part of the wall. and i've love to put in ceiling tiles, and finish off the raw wall that shows the studs from the finished living space downstairs. it also shows the new plumbing for the downstairs bathroom. at least it would be really easy to fix any plumbing problems! a plus to my basement laundry room: it has three good-sized windows, so there's plenty of natural light. and there's a closet where i store clothing from days gone by - shoes and sandals and dresses and skirts. i guess i still think that maybe someday i'll be in need of that sort of attire. i did wear one of the skirts to paula's wedding last summer. i guess it's my wardrobe to save for that once-a-year need. 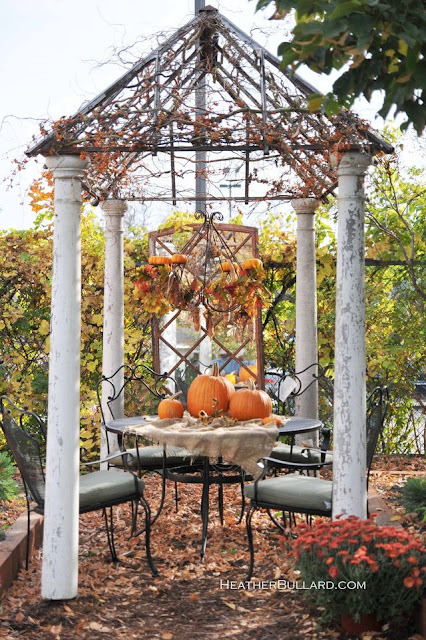 can anyone find anything more ideally autumn than this, from heather bullard's blog? i like the vines, and the burlap on the table. i see hancock fabrics has burlap on sale this weekend, and i would love to pick some up and put it to use somewhere. so far my weekend wanderings (whilst i'm a hunter's widow) will include the one-day sale at macy's (i have a gift card from cousin aaron and wife jenny) and hancock fabrics, and probably odds and ends, too! 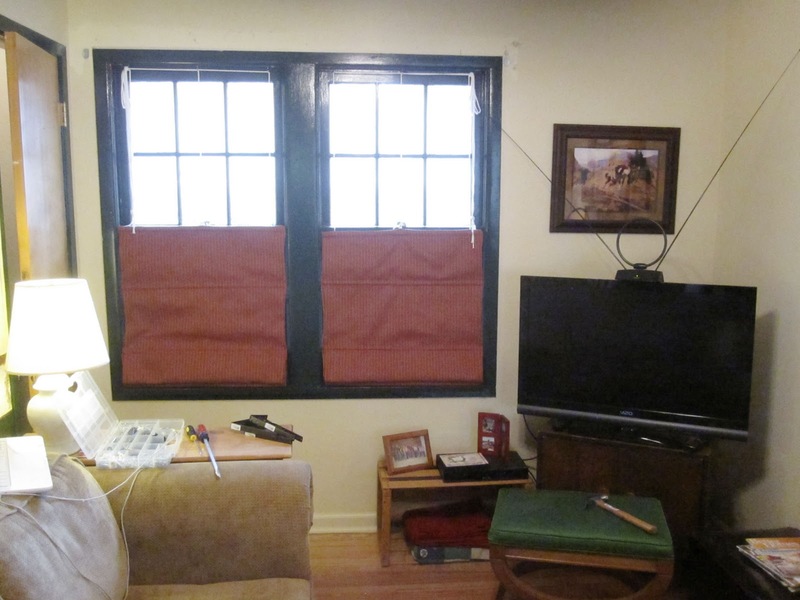 i've also looked into how to make a top-down roman shade for my living room windows. i can never decide which fabric to use... there are too many pretty patterns, colors and textures. this color palatte is from one of my regular visits, colourlovers, and it's one that the upstairs of my house tends to follow. except i've added deep blue instead of dark purple. so maybe the shades in my living room i will make from mustard yellow, to continue the yellow color on the walls of the front room? 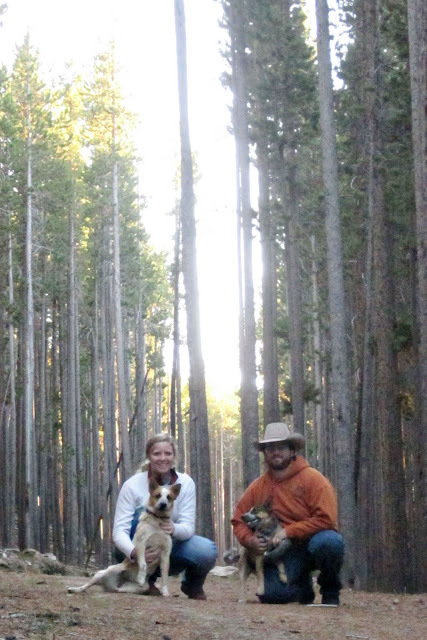 tonight after work scott and i loaded the pups and went up on the mountain for an evening walk. it was a wonderful evening, especially for oct. 20. we brought one of their dog toys to play fetch as we walked on the trails that serve as cross country ski paths in the winter. we got our wedding party invites in the mail yesterday! i'm very pleased with the printing job, and we handed out/sent the first of them today. yesterday i also called on our real wedding rings which we ordered mid-august, and they should be done right before scott's birthday in a month. i also scheduled the chimney sweep/inspection appointment for the wood stove, and he can't come for two weeks. and, i found out that i don't need a birth certificate to get my social security card changed, and therefore all my other records - bank account, drivers license, mortgage, etc. i'd already sent off for a new birth certificate, but i suppose it's best to have one on hand, and one that i can find. this past weekend was once again spent at the ranch. when it's so nice and warm and dry out, it's hard to justify staying in town. however, all the things i've been putting off until it gets cold and nasty are once again put off another weekend. 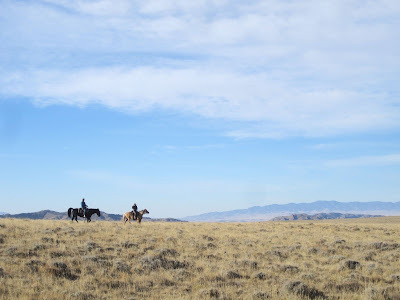 the above photo is sam, a hunter from texas, on the black horse, and sister melissa on her horse dixie while we were moving a few cows from south of the highway back onto the association on the north side. saturday morning scott, sam, melissa and i loaded up after breakfast and we finished this task up pretty quick, as the cows were feeling good and moved along really well. 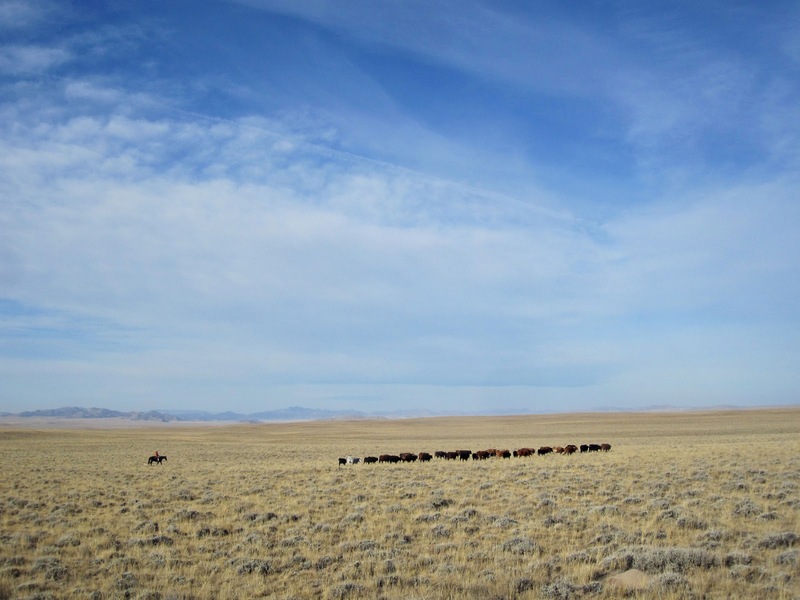 there weren't many cows, just a few with their calves that bob had pastured on a blm lease for the summer. i took lucy once again to help out, and she had a lot of fun with the cows, who would come out of the herd to take her, which only made her feel more important when she went after them to chase them back into the bunch. the heifer calf that scott gave me last spring wasn't in the bunch we moved, but she was in the pasture into which we moved them, so i trotted over there to take a look at her - i haven't seen her all summer. she's the red one in front, and she's growing good, as are all the calves, and she looks nice. next weekend we'll gather the pasture, bringing them all into the corrals for weaning. some will go to the sale barn in riverton the following week, and the heifers will go to a friend's feedlot for the winter. the cows usually also leave the association for winter pasture, but i'm not sure what the plan is for them this year. 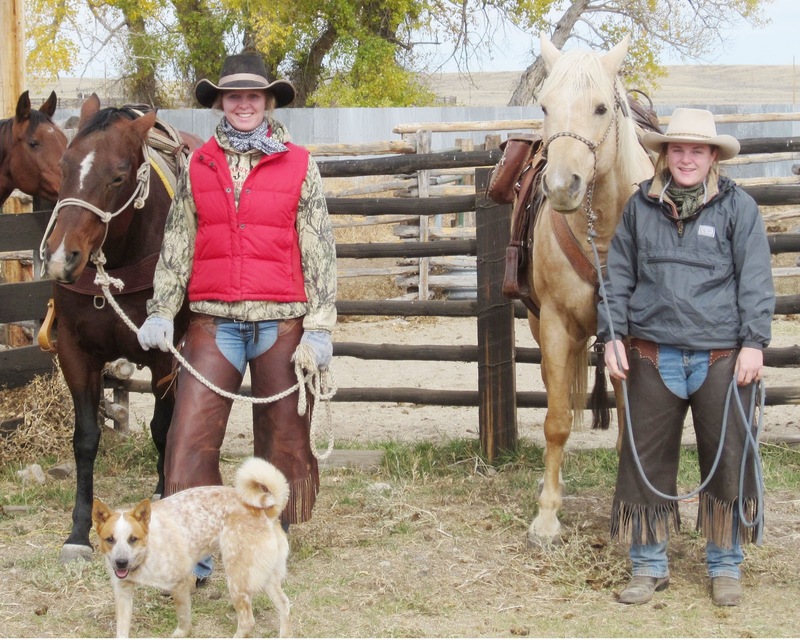 since both melissa and i rode our old mares that morning, i had scott take a photo of us together. these are the two girls we received for christmas in 1994, and they're still going strong. we've come a long way from the pine forests and red clay of georgia, where they both came from as two-year-olds. they will be 18 years old this spring. i'm a little concerned about april heading into winter, as she's a little thin. she was thin going into winter two years ago, and had a tough time catching up. being out on range all summer and fall, she hasn't got the condition on her that i put on her last fall at the stables. since she's in foal - or at least i'm pretty sure she is - i'm even more concerned, and if it decides to come in and storm and be a snowy winter, i'll bring her back into galles stables to keep a closer eye on her. my other one, jazz, on the other hand, is quite rotund. i don't ever have to worry about her at all. sunday morning melissa and i headed out again with our horses. 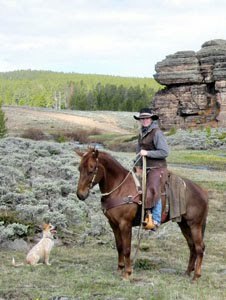 scott dropped us off in one of the mountain pastures and we went and found a bull, moved him to another pasture and rode back to the house. i took foxy with us, along with lucy and melissa's two dogs, and that was the longest trip she'd been on. there were several water opportunities, and she did just fine. the ride back to the house was quite a distance, but it was such a nice morning it didn't really matter. after loading up and heading into town to deliver my horses and clean the office i went to the house to clean up before scott and i went to meet the whole martinez clan and the texas hunters at a mexican restaurant here in town for dinner. another full weekend! and it was good to be back at the house, after being gone since last wednesday morning. i think i might even be winning scott over to the christmas spirit, as last night he mentioned where he thought the christmas tree should go. he grew up with a father who would only let decorations go up two days before christmas, as long as they were taken down the day after, so i count his thoughts on the christmas tree as a big step in the right direction! - noon today i head back to casper from evanston, where i've been for this agrifuture meeting since wednesday. it's been a good meeting, and i've enjoyed my time in evanston. the facility is fabulous - it's the restored railroad roundhouse and machine shop - and the whole town is very hospitable. they're really working hard to generate more visitors, and i think it's working. last night i went to dinner with stock growers staff members, and it was very nice. - i'll head straight to the ranch after leaving, instead of heading back into town first. the ranch is one hour closer than town, and i packed all my riding and hunting clothes and brought them with me wednesday. scott took the day off and is hunting deer today with bob and friends from texas, and this evening my sister melissa will arrive from lander. she's helping us move cows tomorrow, and i'm so happy that i get to join them. originally i was going to have to drive to lander for a day trip and a tour of the new BSL3 lab addition to the state vet lab, but now i've delayed that tour for a month. this BSL3 (biosecurity level 3) addition is a big deal, and good for the state, because now we can work on our own brucellosis issues, and other federally controlled diseases. brucellosis has been a big challenge in our cattle and elk populations. - i have new shirts! yesterday afternoon when the meeting finished i dropped into the evanston boot barn, because boot barns sometimes have good sales. it's hit and miss, but i found two of my favorite cut of shirts for 50 percent, so i have some new additions. i may be in a 'shirt rut' because the cruel girl arena fit style is all i buy, in different colors/patterns, but it's just that i know they'll fit so well - i can tuck them in and the sleeves are long enough, which are good qualities for shirts to have! - the leaves are falling. that means i'll have to buy a rake for my yard soon. 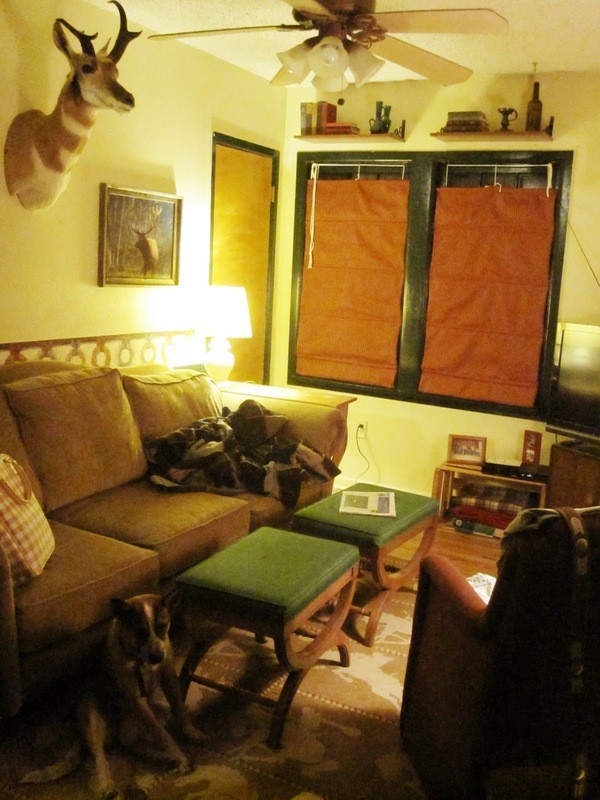 - hopefully next week we'll also get our wood stove purchased and installed in the front room of the house. it will be so cozy, especially when it starts snowing and there's a christmas tree in the front window. - the horses are getting fuzzy! i like late fall, when they start growing their winter hair, but aren't yet completely woolly. - next week will be the only week for quite a while where i'm in the office all week. 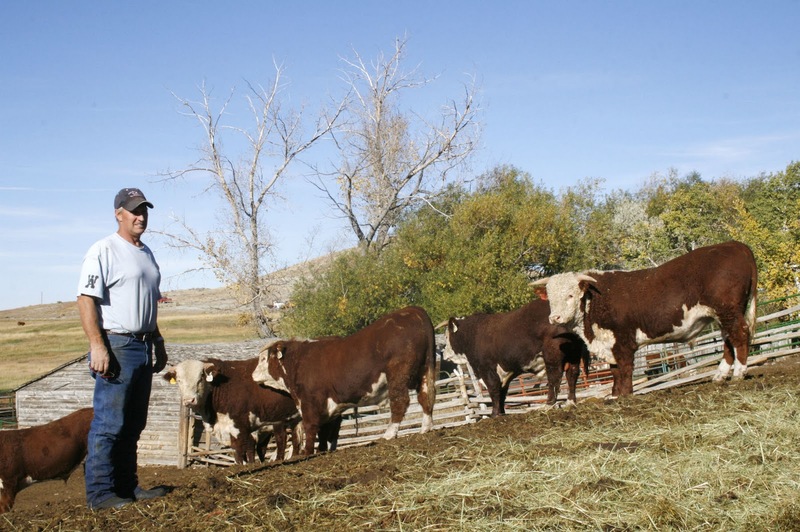 november is convention season for the ag groups in wyoming. - scott's birthday is coming up on nov. 20. we've flip-flopped between birthday weekend plans. right now it's to take friday off - all day for him, half day for me - and then have a party at the house saturday evening. - i finally got our wedding party invitations ordered. they should be here mid-week next week, if not sooner. i got a great deal, including envelopes and address labels. i made them and added them in at the last minute, when i got to thinking about writing return addresses by hand on several hundred envelopes. - i'll be out of cell service again all weekend. while no service is inconvenient at times, it's refreshing to shut it off and be un-contactable for several days at a time. - for some reason that's all i can think of at this time. have a good weekend! SourceGas is the local natural gas supplier. their record keeping is atrocious. October - received notice of disconnect for $50.54. called the office, they said they had the payment, faxed them payment records to straighten it out. next day, received normal bill, showing overdue payment. one day later, received check in the amount of $50.54. what is one supposed to do with stupid utility companies? one side of them is charging me overdue and threatening to stop service, and the other half is sending me money. 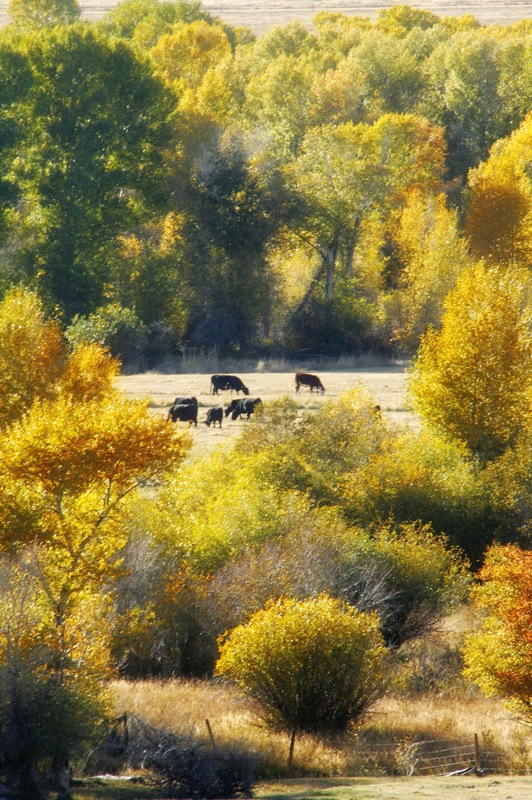 it's autumn in wyoming! granted it may be four or five weeks late, but the temperatures are cooling, the trees are turning, and the thought of snow has entered peoples' minds. 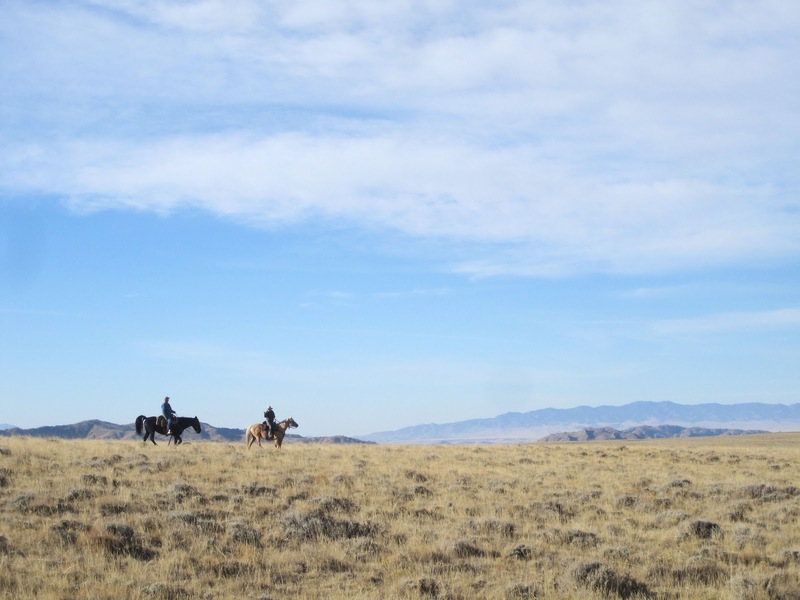 the above photo was taken in wyoming's bridger valley, clear down in the southwest corner of the state. so far, that it falls off into utah most of the time. to get here, one has to drive and drive across the desert on i-80 - a less-than-scenic experience - and finally the interstate drops off and cuts across the north end of the valley, which is filled with small towns, irrigation, meadows, cattle and sheep. i like it there, it's just that it takes so long to get to! i'm in this area for the two-day agrifuture conference, organized by the wyoming department of agriculture and held in evanston. on my way by bridger valley - 30 miles to the east - i stopped and visited with dale micheli, a hereford producer. he's just finished up his first year on the american hereford association board of directors, and that's what we visited about, before going out to take a look at a few of his bulls and getting some photos. their annual bull sale is in a couple weeks, so they're busy gearing up for that. last year they got blizzarded out. hopefully the weather won't change that quickly for that to happen this year. so today includes more meeting-sitting for me. then headed back to the ranch tomorrow afternoon to spend some time before heading to laramie on saturday. too busy! this last weekend was another busy/relaxing one spent at the ranch, helping with fall work. saturday we gathered cow/calf pairs off the meadow near the ranch headquarters and took them to the corrals to sort the calves off the cows. the calves were weaned and shipped off in two trucks, and the cows were pregnancy-tested for next spring's calves. the non-pregnant cows, or 'open' cows, will be sold, and the bred cows will be taken back to the owner's place for the winter. this photo is scott and a guy named willy from cody. the work in the corrals is a combination of on horseback and afoot. after we finished that, saturday afternoon i watched the university of wyoming football game with sister-in-law becky and took a nap on the couch! it was wonderful, until the men started coming in the house and kept waking me up... scott and i went to bed early, and i was actually ready to wake up and able to make it to the house for breakfast fully awake the next morning. saturday morning breakfast was at 5, and we had to wait forever for the cloudy morning to brighten up enough to get to work. at least it seemed like forever. 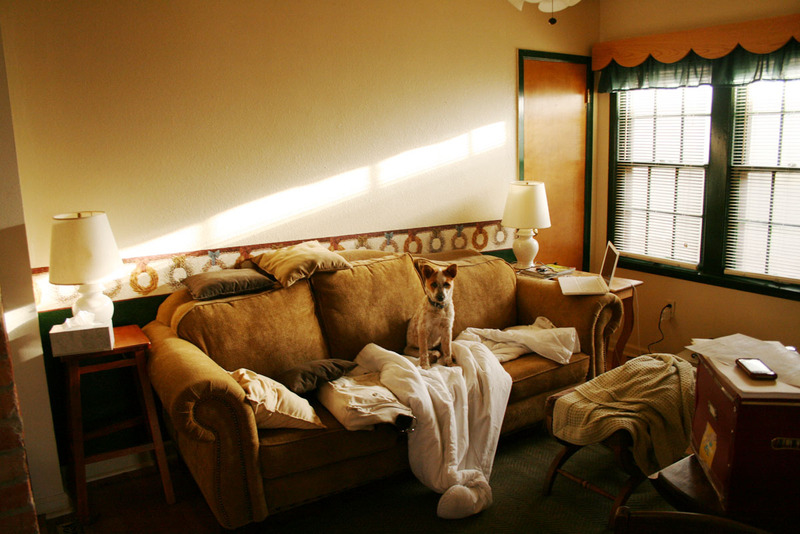 i helped becky do the dishes and clean up the kitchen, and it was still a while before we left the house. even though they're early, and i put off getting out of bed as long as possible, i do enjoy ranch breakfasts. becky always does a good job, and the whole crew sits around and drinks black coffee and eats eggs, bacon, biscuits and gravy, cinnamon rolls or whatever else she's prepared for the morning. sunday morning we saddled again and loaded the horses to go gather a pasture and kick the pairs through the gate to the next pasture over. in a few days that pasture will be gathered, and the pairs trailed all the way to the house, in preparation for shipping their calves. 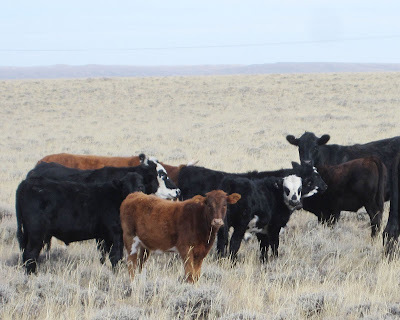 the association is a busy place this time of year, with all the members and those running on leased shares shipping their calves and gathering their cows up to take to their various wintering grounds, to return again the next spring. 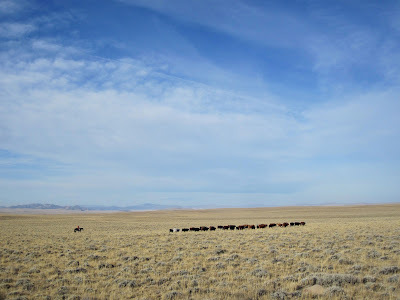 after arriving down at the pasture sunday morning we unloaded and scattered across the landscape to collect the cows, which were pretty much equally scattered to all corners. and we were trying to push them upcountry, and of course all the spoiled girls only wanted to head downcountry. and there was some *ahem* less-then-skilled help that came along with the guy leasing shares this summer, so that made for more work but great stories to recount afterward! my girls were very excited to be gathered up to work over the weekend. it's been a long time since i've got them from their pasture and put them to good use. 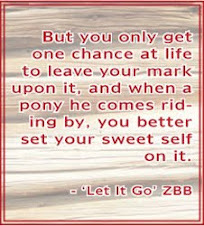 i left them and all my tack up at the ranch for the week, as i have to leave town for three days this week. that way they'll be there when i need them next saturday. scott's little foxy waits safely under the fence at the horse corrals. i think lucy had just come through the creek when i was gathering the colts in so the one could be gelded. all four pups got their rabies shots while the vet was there. meg is lucy's sister, and a very big girl. scott and jamie sunday morning. piling out to unload the horses and gather cows on sunday. following bulls down the bottom, pushing them west to join the rest of the bunch. lucy loves to help. more bulls. it was a gorgeous day to be out riding. lucy knows to take advantage of rest breaks when they're available. this is about half of the cows, right before we kicked them through the gate. fall is a bad season. it's a bad season, because it's when all the western catalogs come in the mail. coworker heather and i have been sharing the pain. fall is when the clothing manufacturers lay out their new designs and tempt all who see. there have been several in the last couple days, and it's a good thing i'm still short spending cash from pendleton (or is it? maybe i shouldn't have spent so much there), otherwise i would have already done a little bit of clicking online and put a few orders in post-haste. i already fell for these jeans and purchased them while in pendleton. but not the hat. those fake, spray-painted, scrunched up straw hats are the bane of western fashion. why can't people wear decently-shaped, upstanding palm leaf or felt hats? i very, extremely rarely purchase jeans at full price - i'm the kind who waits forever to find my perfect size and length on sale - but something came over me when scott and i were in the farm store in pendleton, while waiting around for our appointed wedding ceremony time. i purchased not only one, but two expensive pairs of jeans. this pair is by cowgirl tuff, the other pair is from my long-favorite jean and shirt brand, cruel girl. i think i justify it by saying that, technically, they're work expenses, because i need to keep my wardrobe up for attending meetings and going out on interviews, right? but, price aside, aren't they a fun pair of jeans? i couldn't resist them. there's another pair made by another company that has pistols on the pockets. i like to pair these with my black cruel girl shirt with the zebra-stripe snaps and my new pair of black purple-top nocona boots that has quickly become my favorite. that catalogs that are my most recent wish books are from national roper supply and fort western. so here it is, in the tv area, and scott kicked up and obviously enjoying himself watching the pbr performance on sunday afternoon. we also got a blueray player and an antenna, so it's really a luxury for us. up to now, i haven't even had local channels available, and i have to note that i've never bought a tv in my life. the last two were freebies, and as good of quality as freebie tvs will be. i still can't bear to cough up the money for any cable or satellite - i just don't watch tv enough to justify the expense. scott mentioned perhaps this winter, when it's dark and cold, he would pay for some sort of tv service. lucy likes the new rug, and it even looks like it's her natural environment. :-) actually, she was just really tired from running around up at the ranch and coming back in with scott. and fox is so tough, she doesn't need a rug. and she's nuts. she likes to sleep upside down, and she enjoys her sleep more than any other pup i've seen, with frequent stretches and grunts and groans and contented sighs. you can see a small rubber tire on the floor there beyond her. i made a trip to ross over the weekend, as the dogs were getting low on chew toys, and i found them five new things - and none with stuffing! that's what they get when i get tired of picking up all the fluff balls. and, ross is an ideal place to get dog toys, because they're cheap, and when one set gets worn out i can just go pick up a new variety. yes, still sitting in my meeting in buffalo. i think they're just about done, talking about some changes to the weed and pest control legislation right now, but nothing i'd write about for the newspaper. one more topic to go after this, and then it's back home i go. this is what my evening was composed of: the cattlemen's proof, my red pen, my laptop, ben and jerry's and the tv, which eventually switched to 'the blind side' movie. i was glad to find it on tv, as i'd only seen it the one time in the theater. i proofed until 11:30, sent half my changes to tracy and went to bed. woke up at 5, got ready for the day, sent more changes to tracy and now in another day of meeting. 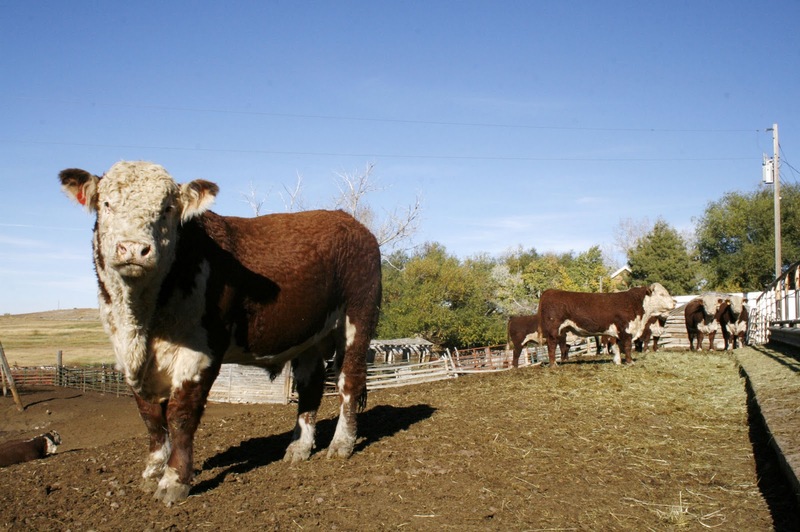 today the wyoming department of agriculture will review their list of bills, which includes nine, by the time we get to the end of it. their segment just started, and is supposed to stretch to 3:30. wouldn't it be nice if they run ahead of schedule? i thought i'd at least share with you the reason why i haven't posted much over the past week. this is the cover of our cattlemen's edition this fall, and it's 36 pages - four pages larger than what i thought the maximum would be. thanks to our sales staff - jody, denise and curt - we are way over in advertising for the edition. that's a great thing overall, but a point of stress for us on the editorial side of things. if they sell too much advertising, or more than i anticipate, and we have to add more pages, that means i might run short of articles to fill those pages. thankfully, everything worked out just about right. 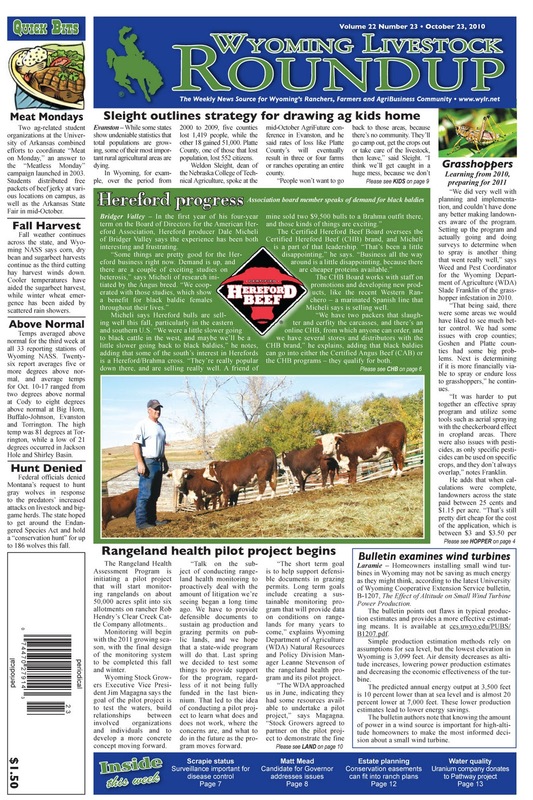 there are 25 articles in the edition, and a 26th that will run on the cover of the regular paper this week, to lead people into the special edition. thankfully i had those extras, as initially i was only planning for 24 articles, including the cushion. in past years we usually use 20 or 21 articles total. the nice thing about this edition is that heather and i had help from two correspondents - echo and melissa. echo contributed two articles, and melissa wrote three, which really is a big help. the remaining 20 were pretty evenly split between heather and i. i forget how it eventually fell with the numbers. but it was a lot, i know that! so, i spent last friday afternoon, after the regular weekly went out, sorting, organizing, editing, labeling, copying and pasting in all the files for the edition. each file holds a document containing the article, title, captions and pull quote, as well as word count so tracy has a better idea of where each article will fit. the photos are also in their corresponding files, titled, resized, lightened and converted to CMYK for the printer. maybe it takes me longer than it would someone else, but i read through everything carefully at least once, making the appropriate editing changes for wording, punctuation, flow, etc. i also spent the better part of saturday working on the files, and by the end of the day i had all of them to tracy. just in time to head out to the beacon for a few drinks with scott, heather and company! paula was also there, decked out in full 80s clothing, for the themed bachelorette party she was a part of. now, we're on to proofing the edition. i'm in buffalo at a legislative meeting today and tomorrow, but i've got the edition printed out, and worked through some of it on my lunch break. proofing requires another careful check of the editorial, as well as formatting, titles, captions, layout, etc. it's the big-picture proofing. this is what the pages look like when we proof. tracy has gone through and blocked out all the ads, fitting them together where they need to go. 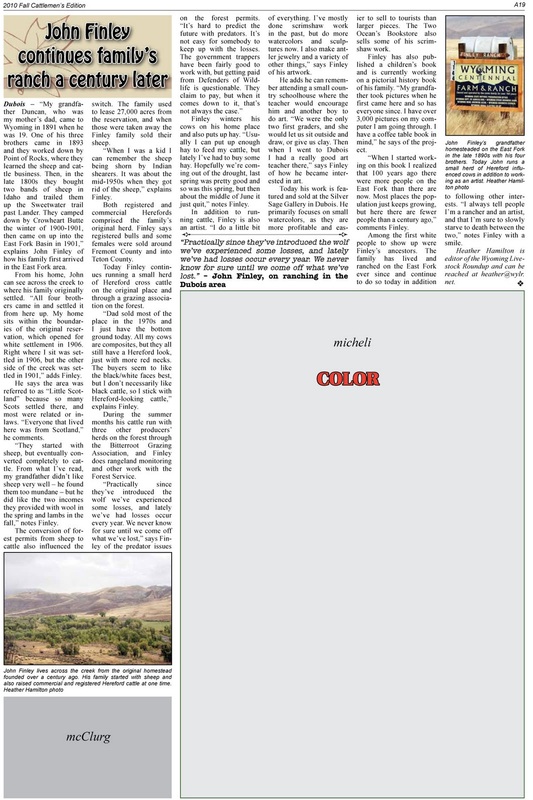 certain ads need color, and most run in black and white, so she has to make sure the proper ads land on the color pages. 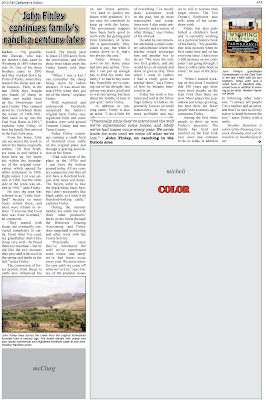 incidentally, the articles that fall on the color pages get color photos, as well. we have an A section and a B section in cattlemen's, so this is a page from A.
so now you know why i've been absent from my blog for some time. 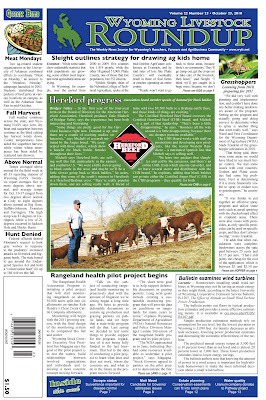 the reason i'm posting at this moment is because we're in the middle of a wyoming livestock board budget and fees report, and most of the important things on this subject we've already covered in the paper. next we're talking about livestock identification, quarantine, feral animals and other such subjects from the livestock board, and i'll have to take copious notes on them. other than work, this last weekend i did get a chance to clean the house a little, put my new rug down, *** install the new tv scott and i bought friday night ***, rearrange a little furniture and thoroughly water the front yard. i didn't go anywhere on sunday, and it was wonderful. it's been a long time, and i needed it. well, here it is friday and i haven't posted since monday! really, all i've been doing is working, and being sick, this week. 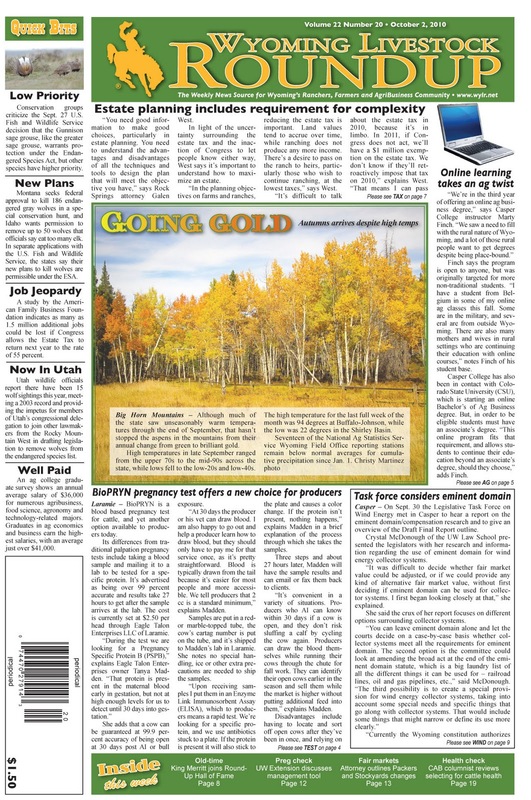 so, for lack of any recently downloaded photos from my little red camera, here's the cover of the paper this week. yesterday it was decided that we needed to add four pages to it, so that meant i spent yesterday afternoon writing three more articles to fill it. thank goodness for leftover notes from meetings past! 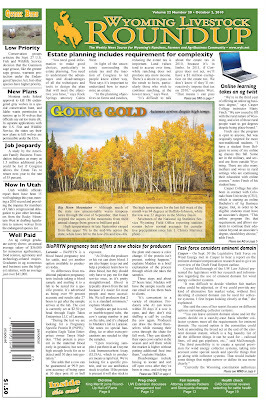 i pulled one article from the stock growers' meeting last june, and another from a wyoming business council workshop in august. never throw away notes! the cover photo for this week is the one i took coming over powder river pass last saturday, when publisher dennis and i were on our way back from coworker jody's mother's funeral services. otherwise, i usually like to put at least two other secondary photos on the cover, but this week i was just too busy to put much thought into it, and i figured the bright gold trees were strong enough to carry it this week. 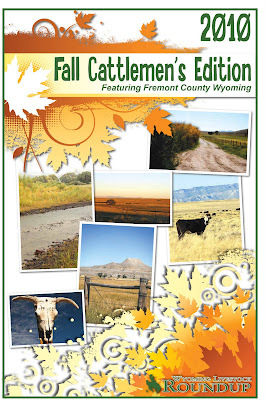 today is deadline for fall cattlemen's, so that's what i'm in the middle of. right now i took a quick break to walk the two blocks down to first street bakers for a lunch sandwich. the conveniences of working near downtown! i have most all the files in for cattlemen's, just waiting for a few odd photos and one more article yet from sister melissa - the one i set her on last-minute. at least i feel pretty much over my cold. if my head still hurt today like it did the last two days, i'd really be having a tough time of it. i would have loved a nap yesterday afternoon, but alas, the blank holes in the weekly paper were calling my name. tonight, when all this work is done, i am headed out for dinner at outback and a movie with my sweet husband, who asked at the week's beginning if i'd go on a date with him this evening. we've also accumulated a bit of funding as wedding gifts, and i think we're going to go look at a new tv - one of the previously decided items on our 'wedding wish list.' nothing big or fancy, just an upgrade from my freebie that has a discolored corner. :-) and perhaps an upgrade dvd player that can play netflix, as the one my brother gave me four years makes grinding and rubbing noises that sometimes rival the volume of the movie.... it's a wonder it still works!